Today for Nail Wheel Wednesday I have glitters from Orly that were postponed due to last week's power troubles. Ideally, I would have gotten this latest batch of displays posted in time for Christmas shopping, but with luck, most of these polishes will still be around during the post-Christmas period, some even at clearance prices, like the gift sets. At the register at Sally Beauty (which I stealthily took a photo of, because I'm just that dedicated), there was a Bitzy display with peppermint nail polish remover pads and mini polishes. Front to back: Embellished (times two), Jolt, and Tip Toeing. Staying at Sally Beauty, it was the only place I saw the China Glaze holiday collection, The Glam Finale. Sally also had three styles of fake nails from China Glaze as part of the holiday collection. (I did also see this display at Ulta, so maybe Ulta had the polishes too but just slipped them into the core display all stealthy like they did with OPI). One of my Rite Aid stores had a CND Vinylux display for a new collection called Glacial Illusion. Shades left to right: Ice Bar, Cashmere Wrap, Radiant Chill, Alpine Plum, Mystic Slate, Winter Nights. These are all labeled as new shades, not limited edition. The mini set on the left is labeled as limited edition; it's got Winter Nights, Cashmere Wrap, Radiant Chill, and Vinylux Weekly Top Coat. I made a rare foray into Walmart because I heard they had this: a display with Color Club Seren-dip-ity Dip polish kits. There are six kits, each with three shades. Ooh, La La has French Tip (white), More Amour (peach), and Three Wishes (gold glitter). Jet Set has Montego Bae (teal), Disco Dress (puple), and Diggin' the Dancing Queen (pink). Backstage Pass has Mrs. Robinson (bright purple), Where's the Soiree (black), and VIP List (multi glitter). Essie has the Ring in the Bling collection for Winter 2017. I saw it first in a sidekick at Walgreens. The mini sets at the top are not part of the collection. The Celebration Collection (top row) of minis has For the Twill of It, Mint Candy Apple, Jelly Apple, and Velvet Voyage. The Rebecca Minkoff Collection (second row) has Cross-Body Heat, Tote-ally in Love, In Hot Purse-uit, and Back in the Saddle. Below the mini sets you can see the Winter collection: Social-Lights, New Year New Hue, Suit & Tied, Ring in the Bling, On Your Mistle-toes, and Be Cherry. There is also top coat displayed here (Speed-Setter and Gel-Setter). Fred Meyer had the shelf top display for Essie Winter, but here it was called "Social-Lights" rather than "Ring in the Bling". Left to right: Social-Lights, New Year New Hue, Suit & Tied, Ring in the Bling (with random close but not quite right bottle filling the slot), On You Mistletoes, Be Cherry. Also has Speed Setter top coat. I saw Finger Paints Winter Glaze display at Sally Beauty; these bottles had brushed silver looking plastic caps rather than the core black ones, but some of the shades seemed like core colors. Left to right: Daubigny's Garden, Sterling Sculpture (times two), Easely Noticed, Base Coat. According to the Sally website, there were six shades in this collection (not including base coat), so I guess I need to make more frequent trips to Sally if I want to catch the displays full. My Ulta had a little cup with a few packages of Incoco nail strips; first time I've seen them at a retail store since Walgreens stopped having the holiday mini packs. I wish they'd show up more. LA Colors had a variety of gift sets out for Christmas. The ones below were at Walgreens, though I saw similar at Rite Aid in slightly different packaging. This had polishes in Gold, Crimson, Evergreen, and White along with a Nail Art Kit. Revlon had an interesting display: Chrome Sweet Chrome, which touts a new "Holochrome Collection". 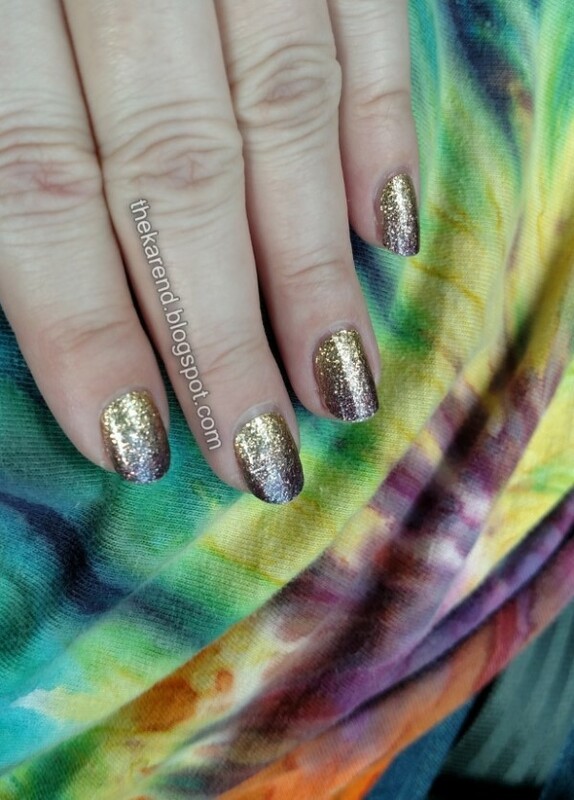 These seem to be a mix of holographic and metallic shimmer polishes. I never managed to find a completely full display, but I'm encouraged that it says "8 new shades" on it rather than limited edition, so I have hope I'll get to look at the colors I haven't seen yet once these hit the core display. Left to right: Hologasm (silver holo?, sold out), Fairy Dust, Amethyst Smoke (charcoal shimmer?, sold out), Blushing, Gilded Goddess, Unicornicopia, Molten Magic, Galactic Pink. I've only seen these at Rite Aid so far. Sally Hansen is relaunching the Insta Dri line, so there are displays of various sizes featuring the new bottles; the shape is the same, but the typeface is new, and the caps are not black across the line but rather color coordinated with the polish shades. There are new colors as part of this relaunch, though haven't been able to do a full study of what's new and what's gone. Overall, I've got the impression that the new lineup is more "muggle friendly", with fewer bold blues and oranges, but those may be coming later. I've marked shades that I'm sure are carryovers from the old core lineup with * below. Fred Meyer had this shelf top display with the new bottles. (I later saw same display at Rite Aid and Ulta.) Front row: White on Time (definitely new, and yay, a white as part of the core line again), Champagne Supernova, Taupe to Go, Buff and Tumble. Second row: Petal to the Metal, Racing Rose, Watermelon Wiz, Peach Buzz, Shakin' Sherbert. Third row: Let's Jam, Just in Wine, Va-Va Violet, Heather Hustle, Midnight Drive, Thyme is Money, Silver Stallion, Clearly Quick*. Back row: Cinna-snap* (sold out here), Expresso*, Slick Slate*, Mauve It*, Black to Black*, Go for Gold*, Rapid Red*, Grease Lightning*, Making Mauves* (sold out). Walgreens had a corner display with a different lineup of Insta Dri shades. Top row: Clearly Quick (old bottle someone stuck in here), White on Time, Champagne Supernova (sold out), Go for Gold, Taupe to Go, Slick Slate (sold out), Mauve It, Buff and Tumble, Petal to the Metal (sold out), Racing Rose, Rapid Red, Cinna Snap. Bottom row: Expresso, Let's Jam, Grape Shifter (carryover), Just in Wine, Va-Va Violet, Heather Hustle, Show Steel-er (carryover), Grease Lightning, Midnight Drive, Black to Black, Thyme is Money, Silver Stallion. The only other new Sally Hansen stuff I've seen recently is the Holiday Collection display at Fred Meyer, which had scented cuticle oil, mini polish sets, and core colors of Complete Salon Manicure. The mini sets had these shades of Complete Salon Manicure: Fool's Gold, Wine Not, Let's Snow, and Red My Lips. The oils were Vanilla Buttercream scented and Peppermint scented. SinfulColors Decked Out either didn't get good distribution in my area or it sold out super quick, as I only saw it at Fred Meyer, and by the time I got there, all but one of the limited edition shades shown on the SinfulColors website were gone. What was here, left to right: Smash Hit (new LE), 24/7, Out of This World, Supernova, Poisonberry, Gogo Girl, Green Ocean. Ulta had Young Nails SlickPour powder coat system, with starter kits, and LED lamp, and colored powders. Since the starter kit was ten bucks more than the Color Club dip kits, plus these require a lamp which Color Club didn't, I didn't look that closely. I sometimes wonder how long I'll be able to do big display roundups like this. There aren't nearly as many new mainstream polishes coming out as there used to be, and stores in my area don't seem to carry as many of the ones that are available as they once did. Also, my Kmart closed, and they often had displays no one else in the area carried. Nevertheless, I'll persist. You may have noticed Nail Wheel Wednesday was once again not a thing this week. This time it was due to a winter storm that dumped lots of snow which meant great skiing but was not so great for power lines and internet connections. Looking on the bright side, not having internet meant I had fewer distractions from shoveling off our decks, which looked like this after the storm was done storming. For today, I have some nails of the day to catch up on. As per usual, I've been going with strips (and fakes, but those are for another post). I really like these Sally Hansen Salon Effects Strips in the Queen Cobra design, which is a brown and gold snakeskin print. I seem to be getting over my aversion to gold on my fingertips. Queen Cobra did show some little sparks of color, which unfortunately I only managed to get on camera after I'd worn them for six days so forgive the tip wear and base gap, please. Sally Hansen Salon Effects in Headbanger went on next. These have black skull and crossbones on a pink glitter background. Yes, definitely embracing gold in a way I haven't before—Salon Effects in The Bold Rush, a gold to purple glitter gradient went on after Headbanger. I especially liked these with a tie-dye t-shirt I took from my mom's wardrobe when I was cleaning out her house. My Halloween nails were Salon Effects Patch-o-Lantern, black jack o'lantern faces on orange. I put these on in the car on our road trip. Yeah, I took a skeleton sock monkey on the trip with me. As one does. My nails seemed to thrive on our trip; I went with just treatment for a few days. Salon Effects Girl Flower seemed to fit the warm weather we had during the Florida part of our road trip. Here they are with an odd jar of silk flower parts floating in water that was in the condo we rented in Kissimmee. The last look of my trip was Salon Effects Antique Chic, which coordinated really well with the dining table in that Kissimmee condo. That brings me to less than a month behind on nails of the day sharing, so I'm happy. Merry Christmas to those of you celebrating! I'll be back post-holiday with the usual mix of displays and wheels and swatches and NOTD.